With Google's special event slated for October 4th, we already have a decent idea of what to expect with regards to the Pixel and Pixel XL. Both have been leaked ad nauseam, and a new sighting offers an idea of how the Pixel XL may look when suited up in a case. The Big G is expected to depart from the Nexus branding with the Pixel smartphones, both of which have been manufactured by HTC. From what we gather, the two models will be priced in competition with other high-end devices of the market like the iPhone 7 and Samsung Galaxy S7. Thus, expect the smaller model to enter the market at $650, with the Pixel XL likely to cost even more. For Nexus fans, all hope is not necessarily lost; the much-rumored 7-inch Huawei-made tablet could make an appearance at next week's event with Google's new Andromeda OS in tow. Considering some of our reader comments, the aesthetics of the Pixel duo seem to have divided opinion. Within these cases by an unspecified vendor, however, the extremities of the outer finish are less noticeable, and those who aren't necessarily piqued by the overall design may be less deterred by these renders. Specs and features aside, are you impressed with the looks of the Pixel devices based on what we've seen thus far? Check out the gallery and do leave your thoughts in the comments. If that phone looks like that it won't sell, that ugly thing looks like a pokémon gadget, looks plain stupid. Googa Peexu, I choose you! lol. Agreed. A black case would be in order. This phone looks like some reject that either Samsung or apple puked up...totally expected something nicer looking than this crap. Except they short change the google pixel, I don't see how the pixel XL will sell any units as its just seems bigger without any benefits according to the leaks we've seeing so far. Same design, same SoC, same camera, same internals. The pixel will eat the XL alive if true imo. Btw, these phones are too average looking for my liking tbh. Well, Guess I'll just have to wait and see them in real life. I remember we always saying this and this phone is ugly then when they come out, they simply shut us all up. Same thing happened with the Nexus 6P, everyone was complaining about the looks, then everyone loved it once it hit the market. BS The only thing people complained about was the camera hump. The rest of the phone was great. I'm not arguing that the phone is great, I own it, I love it, but people bitched about it non-stop when they first saw it. I still think the 6P is one of the ugliest phones I've ever seen. I also think it's big and heavy. Wouldn't use it if it were given to me for free. I don't care for the Pixel renderings, but they're much better than the 6P, IMO. Actually, he's talking about the leaks.. You would not be honest if you don't admit that the nexus 6p leaks weren't universally hated. Even from the usually bias androidcentral, and that speaks volumes. Though I admit that when you do see it in person, it just looks stunning. Yeah. Same thing happened with the iphone 6 series, iphone 7, nexus 6, htc 10, moto z, M8, nexus 5, iphone 5. It happens all the freaking time. infact, the truth is no phone is actually ugly once you see them in real life, no matter how much we paint it. Most phone are actually drop dead gorgeous when you come in contact with them. Even the iphone 6/7 series are a pure work of art when you actually see them in person. Especially the scratch prone jet black model. I don't know what's up with these exaggerations tbh. The only mainstream flagship phones that I've felt were average/ugly have only being the galaxy s3, s5, and galaxy note 2. As far cry from what samsung produces now. It's not like any other phone really looks much better than these. The only 2 things I don't like about them so far are the two tone back and fingerprint scanner on back. Once you actually see any phone they usually look better than the pics. Pictures don't quite capture the true looks of a device. 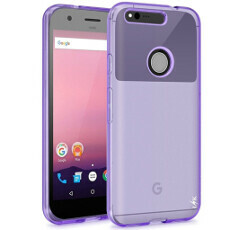 As usual, another Google ugly phone. Looks good so far. Will probably pick one up this time as I was very disappointed in the looks of the 6P. Who cares? If it performs way. These days most people put cases on top of their phones. Why do people still care about design! ?